A STOCK EXCHANGE is a form of exchange which provides services for stock brokers and traders to buy or sell stocks, bonds, and other securities. Stock exchanges also provide facilities for issue and redemption of securities and other financial instruments, and capital events including the payment of income and dividends. Securities traded on a stock exchange include stock issued by listed companies, unit trusts, derivatives, pooled investment products and bonds. 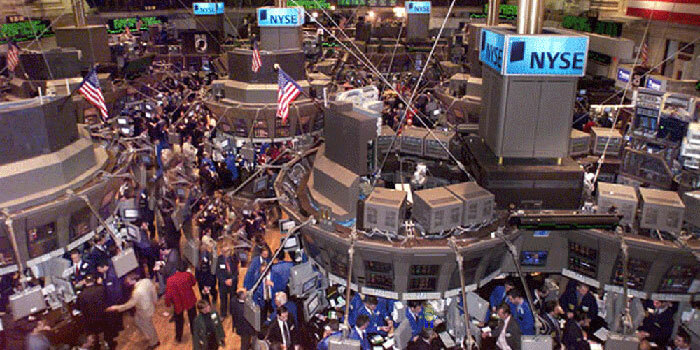 Stock exchanges often function as "continuous auction" markets, with buyers and sellers consummating transactions at a central location, such as the floor of the exchange. A STOCK INDEX or stock market index is a measurement of the value of a section of the stock market. It is computed from the prices of selected stocks (typically a weighted average). It is a tool used by investors and financial managers to describe the market, and to compare the return on specific investments. An index is a mathematical construct, so it may not be invested in directly. But many mutual funds and exchange-traded funds attempt to "track" an index (see index fund), and those funds that do not may be judged against those that do. All of the World’s Stock Exchanges by Size - Visual Capitalist. Biggest Stock Exchanges In The World - WorldAtlas.com. First U.S. bitcoin futures available now - Chicago Board Options Echange (CBOE). How to Prepare for a Stock Market Surprise - The New York Times. MSCI World - since 1969. Market cap weighted stock market index of 1,649 stocks from companies throughout the world. The components can be found here. It is maintained by MSCI Inc., formerly Morgan Stanley Capital International, and is used as a common benchmark for 'world' or 'global' stock funds intended to represent a broad cross-section of global markets. World's biggest stock exchanges - Forbes. SIX Swiss Exchange - since 1995. Based in Zurich, is Switzerland's principal stock exchange.